The mission was the second manned spaceflight in the Apollo program. The three-astronaut crew — Commander Frank Borman, Command Module Pilot James Lovell, and Lunar Module Pilot William Anders — became the first humans to fly the Saturn V; travel beyond low Earth orbit; see Earth as a whole planet; enter the gravity of and orbit another celestial body; see the far side of the Moon with their own eyes; witness an Earthrise; escape the gravity of another celestial body; and re-enter Earth’s gravity. 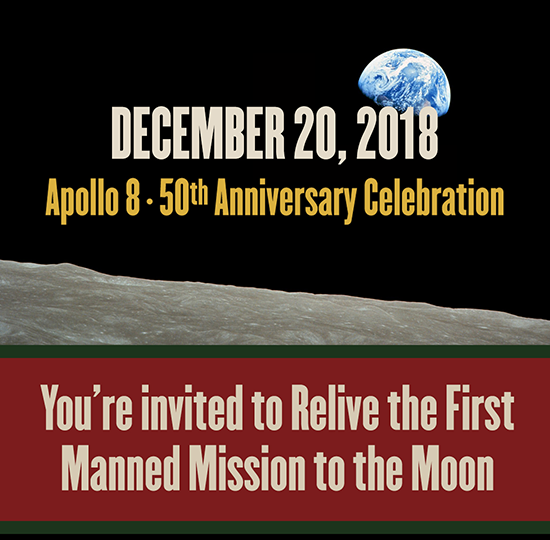 Please join us on the occasion of the 50th Anniversary of this mission to celebrate the honor of the naming of the “Anders’ Earthrise” crater. Mr. Robert Craddock, Geologist, Center for Earth and Planetary Studies, National Air and Space Museum, Smithsonian, will provide a brief history of lunar nomenclature beginning with the first Soviet flyby and ending with the International Astronomical Union (IAU) announcement of the new named craters in the Earthrise photography. For sponsorship information please contact Diane Sutherland or call 619.234.8291 x109. Thank you.